Who doesn’t love to travel, to explore new places, meet new people and see new sights? While I love my home and am something of a homebody, I really enjoy seeing new sights and meeting new people, even if I’m traveling to somewhere I’ve been before. Although she’s only 10 years old, the damsel in the tub who represents Sara’s Soaps ‘n Such is getting ready for her first overseas adventures. Destination? Afghanistan. 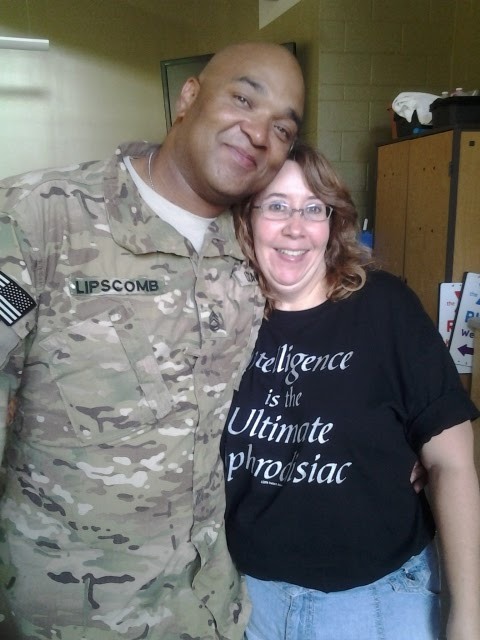 She graced 68 bottles of lotion and 70 tubes of lip balm as she settled into dozens of shipping boxes to head to so many soldiers serving in the Middle East. This came about by the hard work and efforts of the Cary High School class of 1991 alumni, coordinated by Patti Clapper. One of our own, Jonathan, is serving in Afghanistan currently and has alerted us to soldiers who don’t receive a lot of packages from back home. Patti organized the Soldier Supply Drive, and quite a few of us came together to help. Even Jonathan showed up, surprising his eight-year-old daughter, which one of the local news outlets covered. 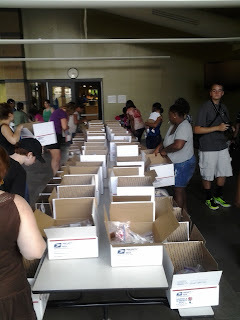 Here are all the boxes lined up on the table, each one filled with goodies like hygiene items, food and other treats. If you wish to help us with future supply drives, please watch this space, my Facebook page and subscribe to my newsletter to find out when the next one is and how you can help.